Dani has been waiting to go to school her whole life! Now that the time has finally come, she has only one fear: that she won't make any friends. Suddenly, Dani is no longer the happiest girl she knows. Her greatest fear has come true: she has no friends. Things get worse. She falls over and hurts her knee. She gets tackled playing football and hurts her head. She shoves a boy in her class so hard that he almost knocks out his two front teeth on the floor. Even her dad's attempt to cheer her up with a gift of two hamsters can't make things better. But slowly, little by little, life improves. New friendships are formed. Ella invites Dani to spend Easter with her. And Dani realises that she has faced sad times before — minor ones, like falling and hurting herself; and truly big ones, like the death of her mother — but she has always managed to find happiness again and there will always be new chapters to write in the story of her happy life. This is a beautifully conceived story that's ideal for early readers with its combination of short chapters and an illustration on every page. 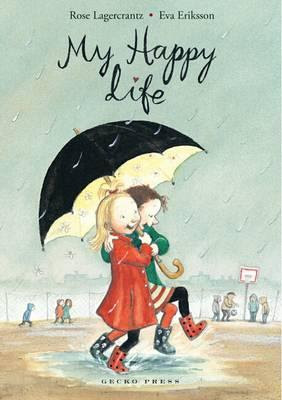 Written with humour and sensitivity, and perfectly capturing the emotional world of a young child, My Happy Life also provides a valuable introduction to emotional resilience and dealing with life's ups and downs.